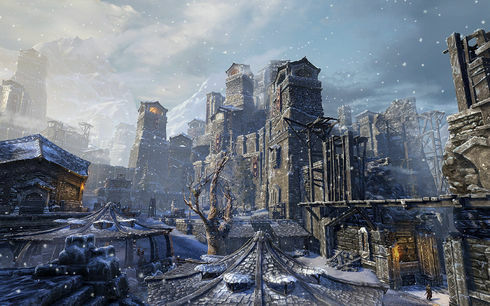 The Wrothgar Mountains have been home to northern Tamriel's Orcs since the beginning of recorded history. Invading armies have marched into these peaks countless times to suppress the fractious Orcs, but the clans always rise again. A King-Sized Problem: Investigate an attack on Orsinium's temple of Trinimac. Quarry Conundrum: Investigate the strange occurrences in Graystone Quarry. The Anger of a King: Discover what has put King Kurog in such a foul mood. The King's Gambit: Find a way to stop the Vosh Rakh's attack before it happens. Blood on a King's Hands: Reach the temple and ensure your allies at the Great Moot are safe. Long Live the King: Make preparations for a traditional Orc ceremony. On a stonecutter's scaffold. South of Graystone Quarry in a barrel on a platform. (map) There's a tricky jump to get the platform with the shard. Caught in the webs of the old city. Inside Old Orsinium. east section with spiders in water and glowing flowers. (map) This room has constantly respawning spiders. If you're with a group, you can take turns grabbing it. If you're by yourself, you'll have to find a gap while they're still dropping from the ceiling to grab the shard. An unusual egg for harpies. Inside Coldperch Cavern, in the south hallway with harpies. (map) Several waves of Harpies will spawn as you approach the shard. This page was last modified on 3 February 2019, at 18:05.